In large part this site is fully dedicated to the local mom and pop shops and small local chains who still make our favorite dough balls with the same loving care that will cause most moms to whip up a batch of cookies to solve life's problems. However, when I heard that a large national chain was sponsoring a charity "Donut Race" to benefit the North Carolina Childrens Hospital, not only could I not comment, but I am seriously considering going down and participating next year. All of you should do the same. Thanks to one of my gracious colleagues and loyal viewer,Vince Egan, (golf clap please) we may now share with you, THE KRISPY KREME CHALLENGE!! 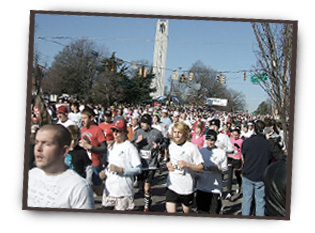 Per their website: The KKC is an annual student operated race in Raleigh, North Carolina benefiting the NC Children's Hospital. Beginning in 2004 with a mere 12 participants, the race has grown exponentially to a whopping 5500 runners in 2009. The race has rapidly become one of NC State University's newest traditions. The challenge attracts a wide range of runners from beginners to serious competitors hailing from all corners of the country. With an expected participation of 7,500 runners, we are expecting the 2011 race to be our greatest (and most beneficial) race yet. This race made we wonder what similar events might be out there which we could snack upon. Note the question is not, are there other events? But, what other events, because this is America after all and we all know the truth is stranger than fiction; especially the donut truth. Now, while my lovely hometown of Boston does not yet have such an acclaimed event, (we do have a marathon but they don't have donuts there) I am certain there are many other brave soles all over the global stretching, strapping on their running shoes and going for the gold..golden crispy donuts that is! Whether it's for charity, a dare, or just good clean competition, donuts are for the masses. HERE HERE! And keep em down boys! The Nissan Juke, saving the day with donuts!